The Colorado Avalanche –aka BU West—have announced roster numbers for the upcoming training camp. Brandon Yip, who led NHL rookies is goals per game last year wearing #59, will now pull on #18, his BU number—also the number worn at BU and for the Avs by Chris Drury. Kevin Shattenkirk, given a good chance to earn an Avs roster spot, is #8, Colby Cohen wears #36, Zach Cohen is #15 and David Van der Gulik (photo), a free agent signee, also secured his BU number, 7. A well-meaning Avs blogger posted images of the players' sweaters but apparently thinks VDG’s middle name is Vander. Rookies report Sept 12 and veterans Sept 17. First year pros. Avs' Returnees. ► The Terriers will open 2011 in Chicago, skating in the Shillelagh Tournament on Jan.1 & 2. They'll opposeMankato State and either host Notre Dame or Brown. Ticket information. ► Hockeysfuture.com has updated its ranking of Dallas Stars' prospects and sophomore Alex Chiasson is slotted at #4. Freshman forward Matt Nieto, at the NHL's RDO camp in Ontario for top 2011 draft prospects, talked about some of the variations on the faceoff, icing and shootout rules tried out there. Nieto also found himself on this week's The Hockey News' Hot List of RDO camp participants, ranked #4. Talk to California kids and they’ll all name-drop Nieto as one to watch in the future. Based on his work at the R&D camp, it’s no surprise. Nieto is a very slick customer with speed and offensive smarts. He played on a line with fellow Cali export Shane McColgan and was dangerous all game long. He’s bound for Boston University. Draft eligible in 2011. The previous week's Hot List rated the top performers at the recent Memorial of Ivan Hlinka Tournament, with 2011 recruit Cason Hohmann, top scorer for the U.S. Select 17 team, in the #3 spot. Undersized at 5-foot-7 and 150 pounds, Hohmann hasn’t let his frame become an issue yet. The playmaking pivot led Team USA in scoring at the Ivan Hlinka with six points in five games and can stickhandle like a demon. He’s committed to Boston University in the future. Draft eligible in 2011. All-American forward and captain of BU's 1971 national champions Steve Stirling has been named an assistant coach for the Ottawa Senators' AHL affiliate in Binghamton. Stirling, who was head coach of the NHL Islanders for a year and half, most recently coached the Iserlohn Roosters of the German elite hockey league (DEL). Stirling also has coached NCAA hockey with Providence College and Babson College. Another former Terrier captain, Pete MacArthur, also is on the move. A three-time Hockey East All-Star who is #18 on the all-time BU scoring list (64-83-147), MacArthur signed on with Phoenix's AHL affiliate, the San Antonio Rampage, after spending the past two seasons with the Rockford IceDog. You can be sure that BU Women's Team Coach Brian Durocher, assisting with the U.S. U-18 team in Lake Placid, was also keeping tabs on the U-22 games between the U.S. and Canada with five of his skaters taking part. Canada swept the series with hattricks by transfer Jenn Wakefield and freshman Marie-Philip Poulin pacing the game two and game three wins. Dave Tomlinson, a high scoring center on BU’s 1990 and 1991 Frozen Four teams, has been named the new radio colour analyst for Vancouver Canuck games on Team 1040, replacing Tom Larscheid, who held the job for 33 years. Tomlinson has been a sports radio talk show co-host since retiring from pro hockey in 2006. 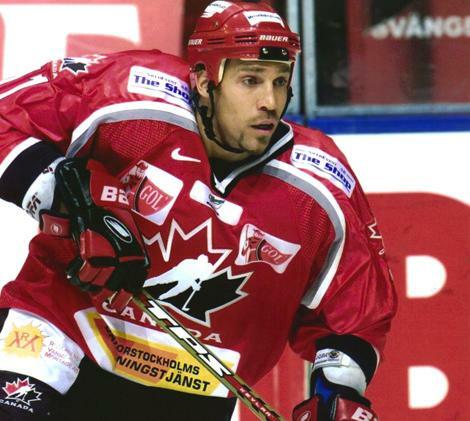 Following stints for Toronto, Winnipeg and Florida in the NHL, he lit it up in the German DEL league, primarily for Mannheim, for more than nine seasons, becoming one of the league's most popular players. His sister, Karin Rego, traces Tomlinson’s career for her blog, “For Crying in the Sink,” from learning to skate through college and pro seasons and then his new career in radio. New England Hockey Journal’s Bill Keefe profiled 2013 BU recruit Matt Grzelcyk, the Belmont Hill defenseman who will join the NTDP U17s this season. He’s also a Charlestown, Mass., native and among the “newest wave of Townies.” NEHJ points out Grzelcyk’s predecessors who also skated for BU, including Olympic gold medalist Jack O’Callahan, Paul O’Neill, Billy Cotter and brothers Mike Fidler and Mark Fidler. Mark Fidler, who led the Terriers' 1978 NCAA championship team in scoring and is #8 on the Terriers’ all-time scoring list (77-101-178), was Grzelcyk’s coach for the ’93 Middlesex Islanders. Matt, a ’94, played up on the team, which also included Fidler’s son, Mark, now a junior at The Dexter School, where he plays for former Terrier d-man Dan Donato. The Boston Globe’s Fluto Shinzawa reports on the dilemma faced by unrestricted free agent Jay Pandolfo, whose contract was bought out by the Devils after 13 seasons and two Stanley Cups with New Jersey. The salary cap and restrictive contracts for over-35 year old players have made signing with a new team especially challenging. Pando, a former Terrier captain and a Hobey Baker finalist in 1996, is working out with Mike Grier and Chris O’Sullivan, two of his teammates on BU’s 1995 national championship team while waiting for news from his agent, Bob Murray, a defenseman on BU’s back-to-back national champs in 1971 and 1972. Bleacher Report has issued a list of the top 25 emerging NHL forwards, including Terrier All-American and top scorer on the 2009 national championship team Colin Wilson. The storybook path that took Matt Gilroy from walk-on freshman in Sept. 2005 to three-time All-American, Hobey Baker Award winner in 2009 and captain of BU’s “miracle comeback” National Champions the same year has gained instant-legend status with Terrier fans. Then, just days after the Frozen Four dramatics in D.C., Gilroy signed a multi-year contract with the New York Rangers, enabling him to begin his pro career in Madison Square Garden where his father, Frank, had played basketball for St. John’s. Gilroy immediately earned a spot in the Blueshirts’ lineup and played 69 games, with a 4-11-15 scoring line. Currently preparing for Rangers’ training camp, Gilroy talked with us about his rookie season in the NHL. Q If you had to give yourself a grade on your rookie pro season, what would it be? A. It was a great experience. It was a good first year, but as for a grade, I don't think about hockey like that. Q. What did you learn during the season that you'd wished you knew about while at BU? A. Nothing. College and pro are very different learning experiences. While at BU I did not think about what the NHL was like; I concentrated on being at BU. I would not change anything [from my time] at BU. Q. Was your brief demotion to Hartford a disappointment or a challenge-or both? A. Being demoted to Hartford is part of playing professional hockey, so it was neither a disappointment nor a challenge rather part of the process. NHL.com's Mike Morreale examines the explosion in top hockey talent in The Golden State and talks with Long Beach native Matt Nieto, who hopes to follow in the footsteps of longtime friend Emerson Etem, a first round pick in the NHL's 2010 entry draft. Terrier freshman Nieto, a top candidate for the 2011 draft, just completed the NHL's Research, Development & Orientation camp in Ontario. NHL Network will air highlights of the 2010 NHL Research, Development and Orientation Camp Fueled By G Series in Otobicoke tonight (Thursday) at 9 p.m. ET in Canada and 10:30 p.m. ET in the U.S. Freshmen Adam Clendening and Matt Nieto (photo) are among the 33 top-rated 2011-draft eligible players at the camp. Details about camp activities are described on the camp blog. For example former Cornell and NHL star Joe Nieuwendyk is teaching faceoff techniques. 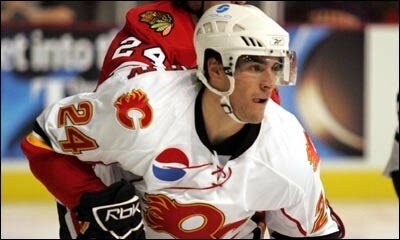 ► Former Terrier All-American blueliner Freddy Meyer has signed a free-agent contract with the Atlanta Thrashers. Meyer had turned pro with Philadelphia and spent the past four seasons with the Islanders. ► 2008-09 Captain Kevin Shattenkirk talked with the Greenwich Post about his preparations for Colorado Avalanche training camp. BU today announced its 2010 recruit class comprised of three defensemen and five forwards. Featuring a 2010 NHL first-round draft choice and a fifth-round selection, as well as two of the 33 top 2011 draft-eligible prospects who will be attending the NHL Research, Development and Orientation Camp this week in Toronto, the Terriers’ recruit class is regarded as one of the strongest in Division 1 hockey. Defensemen Adam Clendening, Garrett Noonan and Patrick MacGregor will fill the roster slots of graduated Eric Gryba and Kevin Shattenkirk and Colby Cohen, who gave up their final year of eligibility to join the Colorado Avalanche. The forwards are Matt Nieto, Charlie Coyle, Sahir Gill (photo), Yasin Cissé and Matt Ronan. All but Ronan had previously been reported by this blog. Ronan is the younger brother of Dan Ronan, a blueliner on BU's 1996 and 1997 Frozen Four teams, and a cousin of Ed Ronan, a forward who played on the 1990 and 1991 Final Four teams and who later played for Montreal’s 1993 Stanley Cup champs. The Terrier roster includes 15 forwards, eight defensemen and three goalies. Alex Chiasson, RW (2009 Draft/2nd round, 38th overall): He’s got good size (6-4, 195 pounds) and is still filling out. I liked what I saw from him at the development camp in Frisco this summer. He moves well for his size and he has a nice skill set. He had a good freshman season at Boston University, and should be in a position to build on that this season. He’s a long-term project since he’s expected to play four years of college. Chris Higgins, a high-scoring wing on BU's 2009 National Championship team, tells the Salem News he will spend his second pro season. Injuries disrupted his first pro season, but he finished strongly with 16 points in 20 games with ECHL Gwinnett. Higgins scored 48 points during his senior season at BU and 133 points during his Terrier career. Four members of the Terrier Women's hockey program have been named to the Canada U-22 team. Jenelle Kohanchuk, Tara Watchorn, Jenn Wakefield and Marie-Philip Poulin will be facing off against their teammate, Kasey Boucher, who is on the U.S. U-22 team, in a series in Lake Placid, beginning tomorrow. 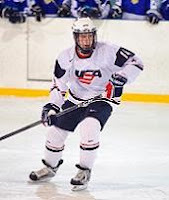 The Americans have also gotten outstanding two-way play from Boston University recruit Cason Hohmann, an undersized but skilled and abrasive forward originally from Arlington, Texas, who played his midget major hockey in Michigan and is currently in the USHL with the Cedar Rapids Rough Riders. From the looks of things, Hohmann has the chance to eventually make the kind of impact for the Terriers that former Boston College mighty mite Nate Gerbe did for the Eagles. ► Past blogposts about 2010 recruit Yasin Cissé reported on his two seasons with the USHL Des Moines Bucaneers and his earning 2007-2008 Rookie of the Year honors in Quebec's Midget AAA hockey League as a member of the Lac St. Louis Lions. The 6-3, 210 rightwing's hometown newspaper traces his path from local Selwyn House and the Westmount Wings to his commitment to BU and selection in the round of the 2010 NHL draft by the Thrashers. The USHL Youngstown Phantoms announced goalie Matt O'Connor's verbal commitment to BU for 2011. Former BU All-American Colin Wilson, now with the Nashville Predators, displayed some "dazzling shootout moves" at the "Believe in the Goal" fundraiser to fight cancer in Winnipeg, where he grew up. The Devils' Travis Zajac and the Canucks' Cory Schneider were among many NHL players at the event. ► The Bleacher Report features Colby Cohen as potentially a top young gun in the NHL for the upcoming season. ► In a Q&A interview with the Union Hockey Blog, Jason Tapp, a Terrier netminder from 1998 through 2002 and now a volunteer assistant goalie coach for Union College discussed his time at BU and former teammates, the goalies he's tutoring for the Dutchmen and his own goalie training company, X-Factor Goaltending. ► Former Terrier co-captain and current head coach of the BU Women's team Brian Durocher is in Lake Placid, serving as an assistant coach to the U.S. Women's U18 team. The team will face off against Canada in the 2010 Women's U-18 Series, this Wednesday, Thursday and Saturday. A member of BU's 1978 National Champions, Durocher served two stints as an assistant to Jack Parker, before becoming the first and only coach of the Terrier Women's program. For incoming freshmen Matt Nieto and Adam Clendening, the itinerary of summer hockey stops has one more venue before they return to Commonwealth Avenue. The pair, who concluded their stint in the U.S. National Team Development Program by winning a second consecutive World U18 championship in Minsk, Belus, this past April, played in the Chowder Cup Tournament in Boston last month before heading to USA Hockey's Junior National Team evaluation camp in Lake Placid (see below). "He did, however, jump out at you playing on the power play with his high level of finesse and skill. He is an excellent skater and hard to pin down when forechecked. He has a very good shot from the point. He is also very adequate in his own zone." Clendening's performance in Lake Placid gave him a leg up on making the U.S. squad that will defend the World Junior Championship this winter in Buffalo. He discussed the road ahead with The Buffalo News. "I thought I was just going to come to camp and be a grinder. I didn't expect to put anything on the board or anything. So, those two goals boosted my confidence. It let me know that I can play with these guys and that I can be a big part of this. Knowing that I could score and contribute definitely helped me out a little bit." The U.S. Select U18s defeated Finland on Wednesday, 5-2, to earn a spot in the tournament's semifinals. 2011 recruit Cason Hohmann (AHR scouting report) scored his third goal in three games and leads the team in scoring with six points. Team USA faces Sweden on Friday in an 11:30 a.m. start (live stats). ► A new addition to the list of links in the sidebar: Dan Sallow's Stars of Tomorrow. 2011 recruit Cason Hohmann continued his strong play in the U.S. Select U18s' first two tournament games in the Memorial of Ivan Hlinka event in Breclav, Czech Republic. On Monday, the Cedar Rapids/USHL centerman scored the game-winner in a 3-2 victory over the host Czech team and assisted on another goal. Today, he added another goal and an assist in a 6-5 shootout loss to Russia. His goal had given Team USA a 5-4 third-period lead. Next up is Finland on Wednesday morning. ►Incoming freshmen Adam Clendening talked with his hometown newspaper, The Tonawanda News, about his experience at USA Junior National evaluation camp in Lake Placid, where he was one of the most effective blueliners and had the opportunity work with U.S. assistant coach and former NHL all-star defenseman Phil Housely. ►NHL.com caught up with former Terrier and newly named head coach of the AHL Wilkes Barre/Scranton Penguins John Hynes, who shared his good news with his former BU teammates at a recent reunion, marking the 15th anniversary of the Terriers' 1995 national championship. Before joining the Penguins organization, Hynes was head coach of the USA Hockey NTDP program. ►Penn State has long been considered a candidate to move its hockey program from ACHA to NCAA Division 1. The Western College Hockey Blog's Chris Dilks explains why the rumored step-up by the Nittany Lions is looking more likely. 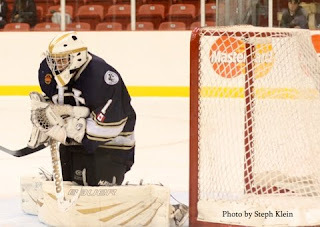 The Terriers filled a critical slot in their 2011 recruit class when they received a verbal commitment from 6-4 goalie Matt O’Connor. A native of Toronto and a 1992 birthdate, O’Connor spent most of the past two seasons with the Upper Canada Patriots of the OJHL, then was traded to Western Conference leader Burlington late in the year for the Cougars' playoff run. In 2008-09 as the only 16-year-old goalie in the league, he won five games and posted a .906 save percentage for the expansion Patriots. Following the Spring 2010 trade to Burlington, he had a 4.55 GAA in five regular season games and a 2.95 mark in four playoff starts. Next season, O’Connor will play for Youngstown in the USHL. He was added to the Phantoms' roster after impressing in a June tryout camp. Last fall, O’Connor was named to NHL Central Scouting’s “Players to Watch” list. ►Another 2011 recruit, center Cason Hohmann, scored twice for the U.S. U-18 Selects in a 3-0 win over in an Ivan Hlinka Memorial Tournament exhibition game. Team USA begins tournament play on Monday against the Czech Republic. ►Team USA concluded Jr. National Team evaluation camp with an 8-3 win against Finland. Charley Coyle, who centered the first line and assisted on two goals, had another strong effort. Adam Clendening added an assist to finish the camp with three points in exhibition games, same as Coyle. • USA Hockey in-game blog. 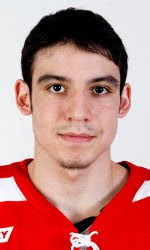 ► Former Terrier forward Vinny Saponari has signed on with the USHL Dubuque Fighting Saints. 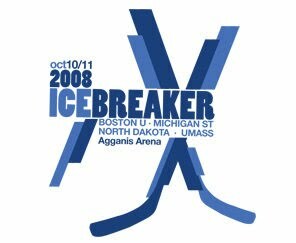 Nine weeks from tonight, the 2010-11 BU Hockey season begins with the Terriers facing off against Wisconsin in the Ice Breaker Tournament in St. Louis. BU has begun a campaign in The Gateway City only once before, 1970-71, when the Terriers helped the St. Louis University Billikens launch their D-1 program. Terriers came away with 8-0 and 9-1 wins to ignite a season that ended with a 28-2-1 record and BU’s first national championship. Exclusive pre-sale offer for the 2010 Ice Breaker Tournament coming to Scottrade Center on Friday, October 8 and Sunday, October 10. Four of the nation’s elite college hockey programs will open the 2010 season in St. Louis as part of a unique two- day, four-game tournament at Scottrade Center. Boston University takes the ice against Wisconsin and Holy Cross faces off with Notre Dame on Friday, Oct. 8 in the 2010 Warrior Ice Breaker Tournament. The championship and consolation games will be played Sunday afternoon, Oct. 10. All session tickets are $65, 55, $45 and $25. An "all session" ticket is valid for all four games. Team USA returns to the ice today with a 4 p.m. EDT contest against Sweden. (Live box score)In Wednesday’s 6-3 win against Finland, Adam Clendening picked up his second assist of the exhibition series, along with a major penalty for cross-checking and a game misconduct. Charley Coyle, who didn’t make the scoresheet, played center again as he will again today. Clendening won’t dress for today’s game as other blueliners are rotated in. We hope to have the official announcement of the men's recruit class very soon. Yesterday BU announced the ten-member women's team recruit class. With eight freshmen and two transfers, Coach Brian Durocher, co-captain of BU's 1977-78 national champions, has assembled one of the top groups in the nation. Included are two members of the 2010 Canadian gold-medal winning Olympic team, Marie-Philip Poulin and Catherine Ward, and an alternate from that team, Jenn Wakefield, wh has transferred from New Hampshire. Two seasons ago, she was a top-10 finalist for the Patty Kazmaier Memorial Award (the women's version of the Hobey Baker Award). Last season, BU's women's team won its first Hockey East title and made its first appearance in the NCAA tournament. First in a series of Q&A interviews with former Terriers who debuted in the NHL last season. After winning an NCAA championship, former Terrier wing Brandon Yip didn’t head for DisneyWorld, but set sights on the NHL. And he got there in just a few months, following recovery from a hand injury suffered at Avalanche training camp injury and a six-game AHL pit stop. Once in a Colorado sweater, Yip did the same thing he did as a Terrier: play physical hockey and find the back of the net. Limited to 32 regular season games, he put up an 11-8-19 line and led all NHL rookies in goals per game. Following the season, he signed a new two-year contract with Colorado. 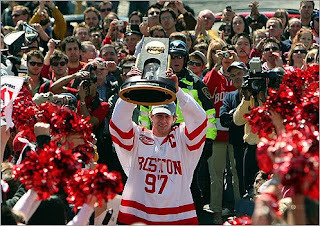 Yip is the only player to score the game-winning goal in two Hockey East Championship games (2006, 2009), tallied 108 points during his Terrier career, which concluded with BU’s comeback win in the 2009 NCAA championship game win against Miami, 4-3, OT. Q. Where have you been spending the offseason? A. I have been spending my offseason in Boston for the most part. I am still training with Mike Boyle in Winchester. I also go back to Vancouver for a few weeks at a time to visit my family and friends. Q. What did you learn at BU, on or off the ice, that has benefitted you in having a successful first season with Colorado? A. I think the most beneficial attribute that I learned from BU and took to Colorado was “work ethic.” Coach Parker really stressed a good work ethic during practice and in summer training. Working hard really does pay off and I have learned that thus far. Charlie Coyle (#18) scored a goal and Adam Clendening (#4) added a power play assist in Team USA's 6-3 win against Sweden in the first of four exhibition games in Lake Placid. Team USA next takes on Finland. Charlie Coyle and Beau Bennett haven't played against the same high-caliber opposition as some of their U.S. teammates. In their first big-time international match, however, both came through with flying colors. Coyle had a goal, dominated in the faceoff circle and showed his great skating ability, and Bennett had a pair of assists as the U.S. jumped to a 4-0 lead in the game's first four minutes and held on for a 6-3 victory against Sweden in an exhibition game during USA Hockey's National Junior Evaluation Camp. "I thought they both did a very good job," U.S. coach Keith Allain said. "Charlie was on the power play, he killed penalties. Beau did a good job for us on the power play. They did what we hoped they would do. … They played well. It was a great game and they were good players in a great game." Incoming freshmen Charlie Coyle and Adam Clendening were among 28 candidates at U.S. Junior National Team evaluation camp to make the initial cut. Another Terrier freshman, Matt Nieto, did not; however, he is featured in a video interview on the USA Hockey site. 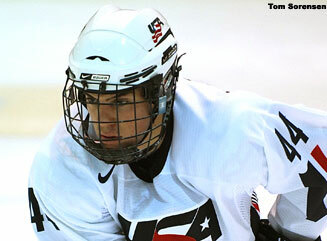 Coyle scored a pair of goals for USA White in the third intrasquad scrimmage of the camp yesterday, won by White, 8-3. He also had an assist in the second scrimmage. A right-shot forward with size, Coyle played center in two of the scrimmages and right wing in the third. Defenseman Clendening was scoreless in three games as was left wing Nieto. Camp continues with exhibition games this week. Team USA plays Sweden tomorrow and Friday and they take on Finland Wednesday and Saturday. BU’s out-of-conference schedule for 2010-11 includes a December 11 game at RPI, continuing the rivalry begun in 1953 during the NCAA tournament and which BU leads 33-28, with three times. An RPI blog profiles the Terriers with a focus on history (and it’s largely accurate). Terrier fans who have attended games at Houston Field House should notice some changes as the ancient arena has been undergoing extensive renovations. While legend has it that the arena was a dirigible hanger in an earlier life, in fact, it was a Navy warehouse in Rhode Island that Rensselaer purchased and moved to Troy in the late 1940s. Another ex-Terrier has snared a head coaching job. John Hynes, a member of BU’s 1995 National Champions and formerly gold-medal winning head coach of the U.S. NTDP U18s, has been promoted to the top spot for the AHL Wilkes-Barre/Scranton Penguins. He was the team’s assistant coach last season. Some player evaluations from the USA Hockey Select camps. Anthony DeAngelo (#2 Royal Blue) 5-11/175 - 6-3-9 w/ 17 pims -- A 10/24/95 birthdate, he's going into the 9th grade and will be playing the first month of the upcoming season in the USHL as a 14-year-old. The BU recruit's skill is undeniable, but he's also cocky. He may want to tone that down a bit before taking on USHL vets. While no one's asked us, we feel that midgets, or the EJHL/AJHL would be more prudent. The Boston Globe reports that Terrier Head Coach Jack Parker is recovering from heart bypass surgery. A full recovery and a return to his coaching duties for the upcoming season is anticipated. The 65 year-old Parker, who was elevated to BU head coach in 1973, underwent surgery on July 23. Here is the Globe report. We'll have further details as they become available. "The entire BU community wishes Jack a speedy recovery and respects his privacy during this time,'' said Lynch. "We look forward to seeing him lead the Terriers on the ice this fall. ''Winners of the 2009 NCAA championship, BU finished last season with an overall record of 18-17-3 (13-12-2 in Hockey East) and lost to Maine in the semifinals of the Hockey East tournament. The Terriers open the 2010-11 campaign in St. Louis against Wisconsin in the annual IceBreaker Tournament, which begins Oct. 8.